Sometimes when H is having a tough day, either because her teeth are bothering her, she’s decided to boycott naps, or it’s just really hard to be little, she can wear us out. Last week was that kind of a week. I finished with my job on Tuesday, so I’ve been a little drained and scattered emotionally anyway. Her canines have officially started coming in just a week or two after the pain subsided from her first molars (all her teeth come in 4’s). I know this because the doctor confirmed the news at her 15 month well visit last Wednesday. She had a fabulous checkup that day, he is impressed with her progress in physical therapy and feeding therapy (have I mentioned those? Another post), she got her chicken pox and MMR shots…and then threw up all over the shopping cart when we went to the grocery store right afterwards. I was fully briefed on potential rashes and pox breakouts a week after the shots, but I was not prepared for the potent mix of foreign stuff in her little body and the hysteria that the doctor’s office now brings out in her. She was happy at the store, and totally fine 5 seconds after it happened, but I had to struggle with a cart, baby, and grocery store floor just covered in barf. I would have had a nervous breakdown right then and there were it not for a truly decent female store employee who brought us a new cart, wet paper towels, and a trash bag for all the dirty clothes. She was my superhero of the day, and I told customer service so. And this was just on our first day back together full time. 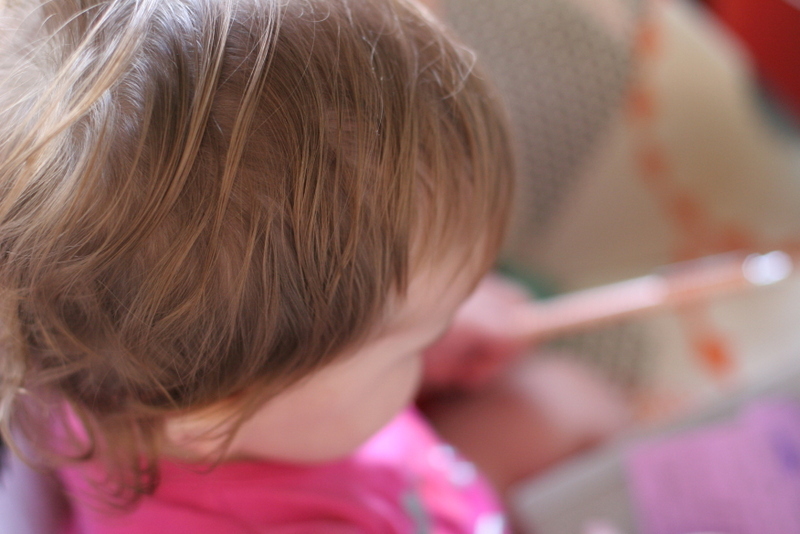 I’m relearning (and in many cases resetting) her routines and habits, and trying to keep track of her little schedule. She’s had so many changes lately. Her beloved sitter got a new job in mid-May, so she’s been gone from H’s world. Then my mom spent six weeks commuting down here from North Jersey to hang out with H and help keep us sane while we just tried to get through the home stretch of the worst work experience I’ve ever had. Now my mom isn’t here every day. It is so hard to reassure someone who cannot speak that everyone still loves her and hasn’t left forever. We will be visiting her sitter at her new job, and we will be hanging out with my mom often. But H doesn’t know that, so she has fiercely attached herself to Adam and me. She wouldn’t leave my side at all last week, and when the weekend came and Adam was home she cried hysterically any time he closed a door (to, say, use the bathroom). All weekend she has refused to take naps unless she can see us. On top of that, she’s hit an age where she is learning our boundaries, and she doesn’t like it one bit. She does not understand why she can’t play in the toilet, or pull heavy objects onto her head, or attempt to climb into the dishwasher. So it’s been that kind of a week with this poor thing that just doesn’t understand all the sudden changes. I get it, and there has been a lot of drop-everything-to-soothe-the-baby happening the past few days. But there has also been the avalanche of life creeping in for the adults, too. The paperwork of losing a job. Trying to put a house back in order that has basically been left to fend for itself for 3.5 months (don’t get me started on the state of the laundry). Planning in-law visits, doctor’s appointments, summer activities. And trying to figure out what in the world I want to do next. All of that stuff burst through the floodgates the second I walked out of work for the last time. But H doesn’t know that, and she needs all the reassurance we can give her, so we have been two very tired and unproductive grownups this week. Especially me; I keep starting sentences and trailing off. Walking into rooms and forgetting why. Showers without Adam around for our old morning work routine mean constantly jumping out to keep H from emptying a roll of TP into the toilet (seriously, what is it with the toilets?). I’ve spent a lot of time lying immobilized under a child that won’t nap any other way. But when I’m bone-tired at night and she’s fast asleep, I look at pictures of that perfect little head (or just go stare at her in her crib), and I wouldn’t change anything. I mean, it would be great not to have to hose your kid off in a grocery store bathroom, or to be able to sit with your own thoughts for five minutes without someone trying to climb into your lap. But she is just so amazing, and we are completely smitten. And honestly, the kid is a trouper. She tries to smile through the stress, and be a good sport, and make the most of a tough situation. It’s actually a little heartbreaking to see her try and laugh through her tears when you make a face at her. She wants to be happy, and she gives it her best try every day. I can’t even say I do that every single day. I love her to pieces, and I’m thrilled to be spending time at home with her. What a wonderful post…real, loving, poignant and so well-written.